A hotel software helps you to simplify your day to day hotel operations, manage your staff and increase your revenue. Which is why it plays a very important part in determining the success of your hotel business. But any hotel technology you pick can only help you as long as it is suitable for your requirements. Along with that, it must keep advancing with your growing needs and expanding business goals. If not, then that particular hotel software is as good as dead or nearing its expiry date. And be careful when your hotel system nears its expiry date. It starts taking your business down the hill and its puzzled outcomes will leave you in a sheer aghast. So, before it happens, you must remain alert and replace your hotel software as soon as it starts showing the signs of ageing. But then again, how will you identify those signs? Here’s where this blog will be helpful to you. It will discuss the top 7 signs or reasons that will assist you to figure out whether you need to upgrade your hotel PMS software right away. Why would you even have a hotel software? To automate your day to day hotel operations, right? But despite having a hotel software, if you have to complete most of your tasks manually, then it is time you think of changing it. Your current system may be working very well with automating a few basic hotel management tasks. But because of its limitations, it may fail to automate a lot of complex operations like housekeeping management, guest engagement, hotel marketing and others. Additionally, you may even have to struggle with confusing interfaces, slow outcomes, many technical bugs and faulty results. Considering these many flaws, it can be easily said that instead of making your work easier, your hotel software is constantly making your work difficult. On the flip side, the ideal hotel software can set all your departments in proper sync. It brings all the controls at your fingertips. So, many of your hotel operations like front-office, housekeeping, billing, inventory distribution and others get completely automated. Consequently, running and managing your hotel business gets easier, faster and more efficient. Moreover, these systems also allow you and your staff to lay a communication web among all the departments. Thus, there are lesser chances of having unreasonable errors – which can be contrary to your present software. Third party solutions like financial accounting software, payment gateways, keycard doorlocks and several others are significant for smooth hotel management. 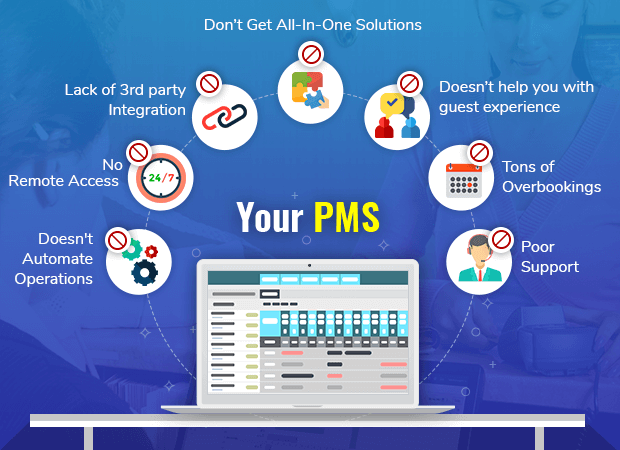 Majority of the hoteliers still operate them separately because their current hotel PMS software cannot be integrated with these solutions. This method needs a lot of human interference with even the data synchronisation getting difficult. Now, such a way of managing your hotel must have worked a decade back, but today it is completely outdated. Today’s smart hoteliers prefer a hotel management software that can be seamlessly integrated with important third-party solutions. This way, their data is well-consolidated at the core, which is contradictory to a system of non-integrated solutions. Besides, by bringing every important solution to one system, they can also save much of their time and money that is normally spent after managing your data with several systems. For this reason, if your present system doesn’t have any or limited third-party integrations which is making you look outside your scope of capability, then it’s the right time to change your current hotel software. Most hotel systems are developed not only to automate your operations but also to make your work simpler and faster. Nonetheless, majority of the hoteliers still spend most of their time being glued behind a desktop-based hotel management system. Now you see, these systems anyway require a lot of maintenance and tag along with heavy expenses. Whereas, an ideal cloud-based hotel management system trespasses all these limitations. In fact, with a proper internet connection, you can even run your hotel from anywhere, at any time. In addition, many of the latest systems even let you operate your hotel through a hotel PMS mobile app, which makes it a stronger reason for you to replace your current hotel software. You know it is time to change your hotel system when you realise that it is not helping you to impart the best guest experience. Obviously, you have to provide all the necessary comforts to your guests but along with that, you also need to engage with your guests from time to time. On top of that, you need to know their preferences and serve them accordingly. And if your hotel software is not helping with any of these, then it is surely not the right system for you. Though, the up-to-date hotel PMS helps you in streamlining all your errands and lets you indulge in much interactive guest engagement. And a few of the systems even let you go ahead and actually know your guests’ preferences with an exclusive self-service guest portal. So, providing a personalised guest experience becomes easier. This guest portal lets you note your guests’ preferences as well as empowers them to direct the course of their stay with you. This doesn’t end here. These software even help you to re-engage with your guests with proper email marketing and scheduling tactics. Receiving hotel overbookings is one of the biggest problems that hoteliers face these days. In that case, if your hotel software is not helping you to control them, then you must seriously consider replacing it. Many a time, hotel systems fail to have seamless integration with their channel manager. Hence, hoteliers cannot have centralised control over their entire hotel inventory. Due to this, they have no command over the timing of the push and pull of bookings that they receive from different sources. This is why they end up with faulty inventory updates and tons of hotel overbookings. On the other hand, an apt hotel management software can be seamlessly integrated with a channel manager so that you can have real-time updates of your room inventory from all the channels. With such integration, hoteliers can not only have updates received from OTAs but also from other sources such as walk-ins and offline travel agents. This way they can utilise their inventory completely. Therefore, have lesser chances of receiving hotel overbookings. So, if your software is not helping you control your overbookings, then it’s high time to replace your current hotel software. Ideally, your hotel PMS vendor must give you an all-in-one hotel technology. Whether it is about managing your hotel operations, receiving direct bookings, handling online inventory distribution across all the channels or any other such concern, your hotel software must help you with all the solutions. Due to the absence of seamless integration among your different hotel technology solutions, you have to find a unique solution to every other trouble that comes your way. This can be tricky and very frustrating for you. In addition, your problem can get even more serious, if your solution provider company does not offer you all the important solutions. Hence, to pick a right vendor company is equally important as finding the right hotel PMS software. The importance of good customer support is next to nothing. But, earlier, when cloud was not so much in demand, most hotel PMS software were on-premise, which constantly needed extensive as well as expensive upgrades. Above that, many hotel technology provider companies entailed a hefty amount of fees for providing software support. However, this scenario is widely changing. Today, some vendors go an extra mile to provide you 24x7x365 support for free. They try to help you with every possible problem that you may face with the software. That’s why, your hotel software become even more user-friendly for you. Moreover, a few hotel technology provider companies even help you with the complete onboarding and implementation of the software. They train you well with its functions, assist you with the updates and even take care of your user-experience in every possible way. That being said, if your current technology provider company is not making any effort in providing any of these services, then it is high time you change your hotel management system. You must consider upgrading your hotel software if it is showing even one of the above-mentioned signs. You should change your system as soon as possible. Because with the passing time an unfit hotel software can lead you to severe revenue loss as well as can hinder your hotel reputation. We also understand that switching to a new hotel PMS software requires a huge investment, time, efforts and risk. But the entire venture will be worthy if you pick the right hotel PMS software. Over and above, looking at the tough competition in the market, most hoteliers are now preferring a system that is smart, user-friendly, transparent and helps them in growing their business. In that case, if you’re still not convinced to change your hotel management system, then chances are, that you just might lag behind in attracting guests and lose a good deal of valuable business revenue.